The experts at DigiPara have devoted themselves to the requirements of the elevator industry for a quarter of a century. Consistent product development to this day: DigiPara provides matching solutions for elevator BIM software and for combination with common CAD-applications. “If you want to reach the top” – with this motto, Andreas Fleischmann founded the company “Digital Partner” in 1989. At that time he developed the first program “Vario Control Center”, which automatically produced the desired geometries from the variables of the AutoCAD drawings. In those days, first small elevator companies were working with the parametric software. In the coming years, countless new ideas have been developed and implemented since 1993 as DigiPara GmbH. 1997 the first Interlift appearance. Since then, the company “came up to the top”. Since 1999, DigiPara has been serving worldwide customers such as Otis, Schindler and ThyssenKrupp and carried out a change in legal form to DigiPara AG in early 2017th. 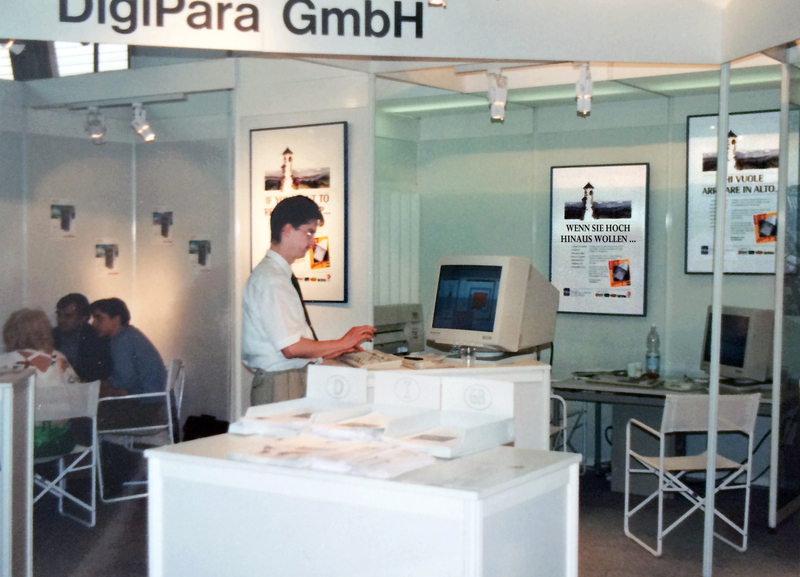 1997: Andreas Fleischmann for the first time as DigiPara at the Interlift in Augsburg. Also this year the DigiPara team presents the current software to the visitors of the booth. At this year‘s Interlift (October 17-20, 2017) DigiPara will be presenting its services with the motto „Elevators. BIM. Automation“ once again as expert for “Building Information Modeling (BIM)“ in elevator construction. DigiPara provides software solutions for efficient planning and configuration of elevators and escalators. Apart from drawing automation via ERP-systems, it is now also possible to use CAD models from common CAD programs with the latest DigiPara Liftdesigner version. DigiPara Liftdesigner has always been the perfect tool for the drawing automation of elevators. Now users can noticeably boost their productivity by using their CAD data and exporting it as 3D BIM models. Use CAD models from SolidWorks in DigiPara Liftdesigner. DigiPara Liftdesigner 2018 permits direct use of original 3D CAD files from SolidWorks, PTC Creo and Autodesk Inventor. Manufacturers can insert their own components in the complete elevator model within DigiPara Liftdesigner and as a result plan their elevator installations in a very detailed and individual manner. In addition, the manufacturers can provide their entire elevator as a 3D BIM model to architects. The DigiPara Liftdesigner Free Edition as a marketing platform for component manufacturers. Component manufacturers benefit from the advantage of promoting their products to more than 1,500 users worldwide directly within the DigiPara Liftdesigner Free Edition. The certified data is available for download on the homepage of the software. All other functions of the current 2018 software will be presented by the DigiPara BIM experts at Interlift in Augsburg from October 17 – 20, hall 7, booth 7130. For more than 25 years, DigiPara has been developing software for efficient planning and configuration of elevators and escalators. As elevator BIM experts, DigiPara’s software products are used in more than 130 countries worldwide as well as in notable international companies like Kone, Otis, Schindler and ThyssenKrupp. In 2017, there were almost 1,000,000 drawings worldwide and 3D BIM models automatically created with the help of our integrated BIM software.